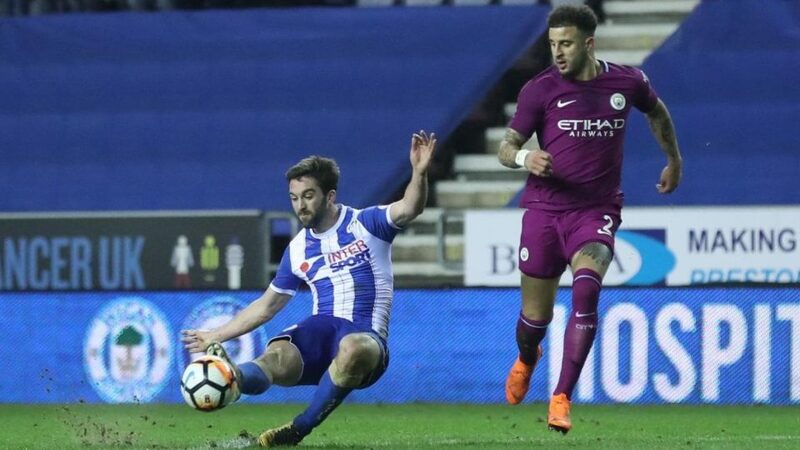 Will Grigg scored on this shot for Wigan Athletic to stun Man City again. ***Disclaimer: Opinions expressed are my own. The English FA Cup is like soccer’s version of March Madness; anything can happen. And we were reminded of that this weekend after two wild finishes. Tottenham made the long trip north to League One Rochdale for a Sunday clash that turned out to be a nailbiter. Ian Henderson scored for Rochdale just before halftime for his sixth goal of the competition, second most of this tournament. Spurs didn’t take long in the second half to respond, as Lucas Moura scored his first goal in his first start since joining the North London squad in January, leveling the score. Spurs seemed to have the game in the bag after Harry Kane converted a penalty kick in the 88th minute. But super sub Steve Davies scored in the third minute of stoppage time to reignite the Rochdale faithful, tying the game 2-2. That was the final score as Spurs will have to work the extra shift again in this cup, with the replay scheduled for February 28th at Wembley Stadium. But the pixie dust didn’t stop there. The very next day, another League One team gave a Premier League opponent a run for the money. Citizens fans certainly were wary of this matchup though; Wigan famously won the FA Cup final over City in 2013, and beat City again the next year. City went down a man after Fabian Delph lost his cool with an angry tackle on opponent Max Power. The ref initially seemed prepared to issue a yellow-card for the challenge, but decided to issue a red card instead. Despite being down a man, City dominated the game, holding a whopping 82% of ball possession and outshooting Wigan 29-4. But a defensive mistake by Kyle Walker allowed Will Grigg to tee up from 18 yards and score in the 79th minute. And this proved to be the game winner as Wigan shocked Man City for the third straight occasion. The English-third-tier squad handed City just its third competitive loss all season. The Blues and Barcelona met in the Champions League for the first time since 2012, with the former hoping for a good start at Stamford Bridge. Chelsea had the better of scoring chances in the first half despite Barcelona holding more possession. Willian had three shots in this game: two which were denied by posts and one that went in the net. His goal arrived in the 62nd minute when he found space from 22 yards out and scored with a low drive. 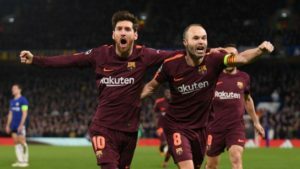 But an Andreas Christensen error allowed for Andrés Iniesta to steal the ball and find Messi, who scored the equalizer for the visitors. Barcelona will return home to Camp Nou knowing that their opponents have a mountain to climb. Lionel Messi (left) and Andrés Iniesta (right) celebrate FC Barcelona’s tying goal at Chelsea. Bayern Munich took 42 minutes to score in this game, but before long it was a flurry at the Allianz Arena. Thomas Müller and Robert Lewandowski each scored two goals in this one and Kingsley Colman scored too, giving the German giants a 5-0 win in the first leg. It didn’t help for Beşiktaş that center back Domagoj Vida was sent off in the 16th minute by denying an obvious goal scoring opportunity. Barring a miracle, Beşiktaş will be eliminated after leg two. Sevilla FC rode into this week on a three-game winning streak and the team refused to back down to Man United on Wednesday. The Spanish squad was the better attacking team in this game, putting eight shots on target to United’s one, holding 57% of possession for the game and amassing a whopping 12 corners. Sevilla forced United ‘keeper David De Gea into two big saves just before halftime, including his save on Luis Muriel’s point-blank range header. United’s defense was able to hold strong as Sevilla kept its foot on the gas pedal in the second half, keeping the score in tact at 0-0 after leg one. The concerning news for United is Ander Herrera injuring his hamstring in the 16th minute, slamming his boot to the ground in frustration. Herrera just returned from a three-week absence due to a muscular injury, and United manager Jose Mourinho stated that this injury concerns the same muscular area as the previous injury. Shakhtar Donetsk remains a perfect three-for-three versus Roma in UCL knockout games. The team is also 4-0 at home in Kharkiv, Ukraine for Champions League games this season. But the Giallorossi struck first when Edin Dzeko found Cengiz Ünder in the 41st minute. 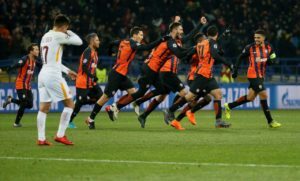 Donetsk tied the game in the 52nd minute when Yaroslav Rakitskiy played a long-ball in stride for Facundo Ferreyra, who cut inside on center back Konstantinos Manolas and tucked the ball past the onrushing Roma keeper. This was a game in which both goalkeepers made some big saves, and Roma keeper Alisson Becker was particularly involved in the second half. But the breakthrough came in the 71st minute when Shakhtar drew a free kick from 25 yards out and slightly on the right wing. Brazilian midfielder Frederico Rodrigues de Paula Santos (Fred) placed the kick over the wall and under the near post to score a great goal. If it wasn’t for a goal-line clearance from defender Bruno Peres in second half stoppage time, Shakhtar would be up 3-1 on aggregate right now. But Peres’ heroics preserved the 2-1 scoreline going into leg two in Italy. Shakhtar Donetsk has been up to the task on multiple occasions during this UEFA Champions League campaign. The opening match of the CONCACAF Champions League didn’t disappoint. Tigres traveled to Costa Rica to take on Herediano in a game that had a late plot-twist. The teams were pretty even in the stats department, with Herediano leading Tigres 16-12 in shots while Tigres held 57% of possession. The scoring opened when Francisco Meza poked in a flick-on from Timothee Kolodziejczak. 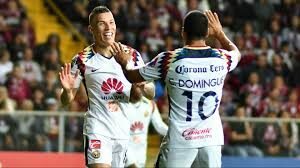 The Mexican side doubled its lead in the 59th minute, when Jurgen Damm paced down the right-wing and crossed to Lucas Zelarayan, who volleyed the ball at the far post to give Tigres its second away-goal. But the comeback started in the 89th minute when Kolodziejczak committed a handball in the box to award Herediano a penalty kick. Yendrick Ruíz converted to put the home team on the board. Minutes later, Herediano earned a free kick on the right-wing. Elias Aguilar sent the ball to the mixer, the ball deflected towards the post, and Jairo Arrieta headed in the equalizer. The spirited comeback not only made for great entertainment, but also gives Herediano some hope going into the second leg. Herediano may have conceded two away goals, but the team confidence is certainly up after the comeback: final score, 2-2. Toronto FC fought through frigid temperatures to win the first leg over the Colorado Rapids 2-0. But the Rapids had their chances. Colorado had a great chance to draw first blood when Dominique Badji split the Reds’ back line, but his shot was too close to ‘keeper Alex Bono, who made a routine save. Justin Morrow opened the scoring in the 55th minute by heading a Sebastian Giovinco cross to the far post. The Italian maestro was not to be held off the scoresheet in this one, as Giovinco scored an impressive scissor-kick goal via an Auro Junior cross in the 73rd minute. The Rapids were shut out as Toronto has a comfortable 2-0 aggregate lead going home into leg two. Tauro FC beat Dallas 1-0 in Panama to earn its first Champions League win since beating Dallas in 2011. The teams were pretty even-steven in the stats department, but Edwin Aguilar headed home the lone goal off a corner kick in the 57th minute. Dallas keeper Jesse Gonzalez got a piece of the header, which looked to be an intended-pass instead of a shot. But Gonzalez couldn’t field the ball cleanly as it deflected off his hands and rolled past the goal-line. Dallas will look for revenge next Wednesday night back in Texas. Last week, I discussed that it was imperative for Saprissa to control the tempo at home against Club América. And for the most part, they did: their passing was pretty accurate and 43% possession isn’t that bad. But somehow the Purple Monster got annihilated 5-1 in Costa Rica. América started off the scoring in the 2nd minute when Cecilio Domínguez broke free and rolled a shot past the keeper. Mateus Uribe smashed a half-volley into the net in the 35th minute to double the lead. Cecilio Domínguez got his brace in the 45th minute off a breakaway which resulted in him scoring from 16 yards out. Renato Ibarra made it 4-0 in the 59th minute by placing a low shot into the corner by the keeper’s left side from atop the penalty area. América’s shutout was snapped in the 74th when Ariel Rodriguez followed his rebound to score from six yards out. But América would get one more when Uribe got his brace with a low shot from near the top of the penalty area. Las Águilas should have this series all wrapped up. They’re the most successful team in CONCACAF history and they aren’t showing any signs of slowing down for this tournament. Cecilio Domínguez (right) and Mateus Uribe had two goals apiece for Club América at Deportivo Saprissa. Tijuana leads Motagua 1-0 on aggregate with the goal counting as an away goal. This game was played at neutral site Edinburg, Texas. Ignacio Rivero scored a fabulous goal in the 71st minute, receiving a low cross from teammate Julio Angulo and lobbing the shot past the keeper. Jonathan Rougier made some big saves to keep the deficit at just 1-0 for Motagua. It looked like Chivas was going to bring a 1-0 lead vs. Cibao back to Guadalajara, Mexico. But they got a big second away goal in second half stoppage time courtesy 18-year-old Jose Juan Macias, who scored courtesy good one-touch passing. The first goal was scored by Jesús Sánchez, who drove a low shot to the near post from close range in the 40th minute. The Goats are in good shape versus the Dominican Republic side. The Seattle Sounders lacked a handful of starters due to injury for this game. But that didn’t stop the Rave Green from starting strong. Nicolás Lodeiro scored the goal of the tournament thus far in the 15th minute, when a Sounders attack prompted Santa Tecla keeper Joel Almeida off his line. A Santa Tecla player broke up a through pass, only for the ball to trickle right to Lodeiro, who placed a perfect lob over Almeida’s head and into the net from 40 yards out. But Santa Tecla stormed back in the second half, putting the pressure on the Sounders. And the Salvadoran squad tied the game in the 67th minute when Gerson Mayen pounced on a rebounded shot from right in front of goal. Santa Tecla drew a questionable penalty kick minutes later, but Mayen made no mistake from the PK spot, rolling the ball past Sounders keeper Stefan Frei to make it 2-1. The former U.S. U-20 international’s two goals give Santa Tecla a slim advantage going into leg two. Olimpia and the New York Red Bulls tied 1-1 in Olimpia’s series home-leg at neutral site San José, Costa Rica. Daniel Royer is picking up where he left off last year, scoring via a header in the 31st minute from a great, long cross by Bradley Wright-Phillips. 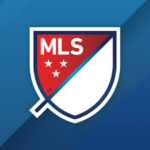 In the second half, Michaell Chirinos drew a penalty conceded by New York’s Aurelien Collin, and Brayan Moya converted the PK to make it 1-1. Olimpia created chances and was pretty even with New York in most regards, but the Red Bulls will be frustrated at the fact that Olimpia still tied them despite getting just one shot on goal. The Red Bulls lead the series for now by virtue of the away goal tiebreaker as the teams travel to New York for the second leg.